The NBA Finals may be over already, but Slam Dunk Fun means no amount of embarrassing performances from LeBron James can kill our spirit. 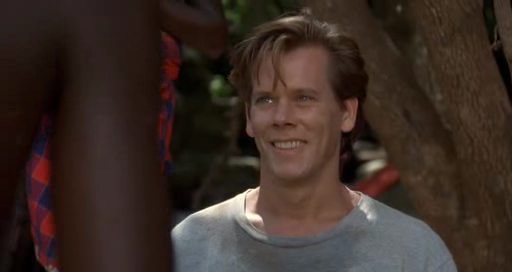 This week, we change gears from films that star famous b-ballers to focus on a random movie where Kevin Bacon plays basketball in Africa in between super-serious performances in A Few Good Men and The River Wild . Next week I promise you we'll be back to mocking athletes trying to act. Spoiler alert: there are slam dunks and also fun. 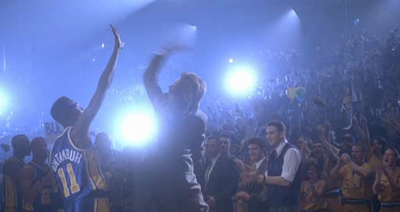 Our film opens on Jimmy Dolan (Kevin Bacon), a St. Johns assistant coach trying to wow a prospective player. The large (white) player makes laughably outrageous demands, namely that the school give him a car, that he have a contract in writing that guarantees he starts as a freshman, and mentions his dealings with his "agent." Seriously, what? Doesn't this kid know booster clubs handle this, and you specifically can't get these deals in writing? The student's braggadocio is so out of control that he challenges the apparently famous assistant coach to a game of one on one, where the much smaller Dolan embarrasses the kid. The defeat is so humiliating that the blue chipper abandons going to St. Johns, presumably because Bobby Knight lets him win at pickup games. I think we can trust the big fat guy with the gold watch who wears a shirt and tie for no reason! The coach gives Dolan a dressing down for not being a team player as a coach, but the hot-head refuses to listen to this sagely advice, instead presumably learning it through a series of events and possibly a montage in the next 90 minutes. Dolan confuses Africans with Vulcans. Later that day, the coach makes a Phil Jackson-ish announcement that he's retiring next year. 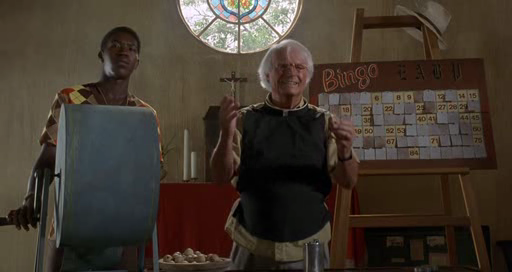 Dolan hits the bar during an educational film about a missionary school in Africa. He sees a giant African and remembers that Dikembe Mutombo and Hakeem Olajuwon are also from that continent, so naturally he should go there right away! We cut to Africa, where Dolan apparently took the express plane, and is now riding a bus. He is unable to get a bus to the tribal village, so he has to wander around the local town. 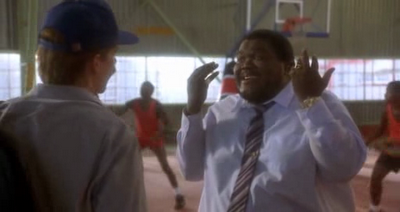 He runs afoul of the local Kingpin, a gangster named Nyaga who trains his goons to play b-ball for no apparent reason. The kingpin thinks Dolan is here to recruit a man who is obviously in at least his late 20's, then becomes decidedly less friendly when he realizes Dolan didn't just show up here unannounced to sign one of his hired goons. 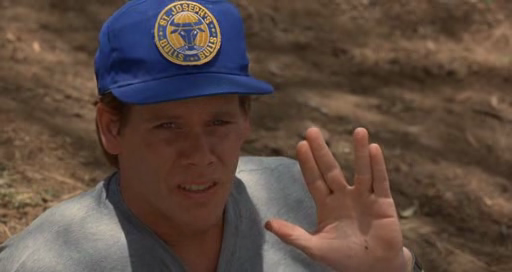 Kevin Bacon turns on the charm. 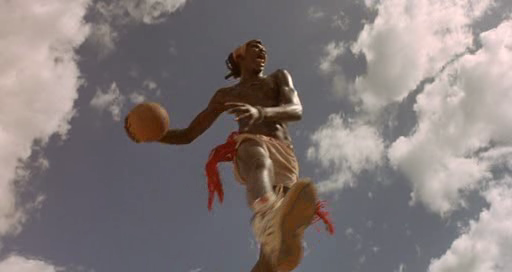 Dolan finally gets to the village and meets the giant young Saleh, but is disheartened to discover the kid has very little in the way of core basketball skills, but is slightly more heartened to discover that the kid has been messing with him, and, like all Africans, is automatically awesome at all non-water sports. Dolan promises Saleh he will live like a king: presumably that means he will have a huge amount of hype but then choke in any meaningful games. Dolan is told Saleh is the chief's son, because we're barely into Act 2 and there's no chance Saleh could easily just go to the school and the next 60 minutes is just him spearing the other team's mascot or something. Dude's ears hang low. He should tie them in a knot (or a bow). Dolan can't convince the chief, so he agrees to work with the tribeman to show he's serious. Fortunately, it's not like he's got to work a 12 hour shift at the nuclear plant, so he's able to get by with only a few hilarious setbacks. Dolan's help causes him to run afoul of Nyaga, causing him to ruin Saleh's sister's wedding. This of course leads to a final showdown on the b-ball court, where the bad corporate guys are the shirts and the noble savages (and Dolan) are the skins. If the bad guys win, and Dolan is forced to put up with whiny prima-donnas as an assistant at some other school, the village mining rights are sold, and puppies are killed indiscriminately. The good guys win, and Saleh comes to America, Jimmy Dolan is a head coach at St. John's, and the AIDS epidemic is curtailed. Just kidding, that last one is still a major problem that not even high stakes b-ball can solve. Presumably Dolan died moments later in a tragic high fiving incident. The movie is a reasonably entertaining, completely formulaic exercise. Kevin Bacon brings his usual performance, and the b-ball scenes are pretty well-done, although the scene where Nyaga stood in front of a green screen projecting his team looked pretty awful. But the guy playing Saleh is pretty freakishly tall, and the evil team seemed to have some real players, too. All in all I'd say the actual depiction of basketball wasn't half-bad, especially compared to the disasters you see in otherwise serious melodramas like American History X. 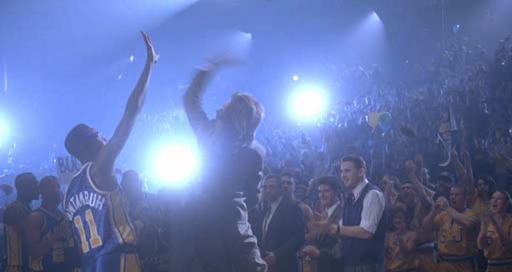 On the other hand, it did end with a freeze frame of a high five while the music played "Higher and Higher." So there's room for improvement. Jimmy Dolan: Don't talk to me about places not worth shitting on! I'm from Buffalo! Tribesman #1: I defend like a Buffalo! 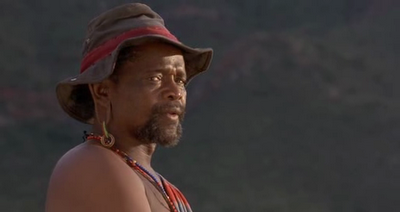 Tribesman #2: You smell like a Buffalo!